The basic principal of solar thermal is to transfer solar radiation into heat via a thermodynamic system which is essentially a generator or engine. This process creates mechanical energy which can be used to then generate electricity. This system is different from a solar panel as a solar panel will directly utilize the sun’s energy to generate electricity. There are records of solar water heating dating back over one hundred years to as early as 1896 when it was invented in the United States. 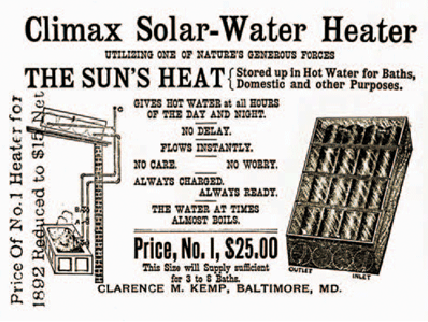 The earliest examples of solar water heaters were essentially boxes that were painted black and filled with water. A major drawback of this system was that it took all day even in optimal conditions for the water to heat up and would rapidly lose heat at night as there was no means of insulation or heat retention. The inventor Clarence Kemp (right) developed a new system that improved the solar water heaters ability to retain heat. His improvements to the system meant that solar water heating became commercially viable on a wide scale for the first time. The system was the first batch water heater and incorporated storage and collection of hot water inside a wooden box. Another notable pioneer in solar thermal technology was William Bailey who in 1909 created a more ergonomic compact design and became a market leader in solar thermal energy. The system Bailey invented was the first thermosyphon system which placed the tank on the roof and a collector underneath. Bailey’s system also meant that hot water could be used day or night which was a great improvement on the old system. 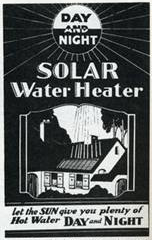 By the nineteen thirties, the use of solar water heating was widespread throughout California and Florida. Bailey’s thermosyphon system works by passively heating a liquid like water. Solar energy is used to create heat energy which is stored in a solar collector. The water can either be circulated through the collector for heating or it can be transferred to a tank through a heat exchanger. Water that is heated by solar energy flows up through copper pipes as it is less dense than the cold water. The liquid is circulated like a closed circuit with the less dense liquid exchanging its heat inside the storage tank or collector. By the early half of the twentieth century about thirty per cent of homes in Pasadena California had solar powered hot water systems. There was also a booming solar industry in Florida which became a major manufacturer of solar thermal heating systems. As a result of copper being used only for military purposes during world war two the solar thermal industry shrank considerably and caused a drop off in interest in solar thermal energy but the industry recovered after the Second World War. The early solar heating industry was mainly confined to California and Florida because the technology at the time would freeze during winter. 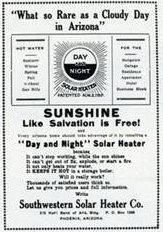 After the end of the Second World War, over fifty per cent of homes in Miami had solar water heating installed. Large advancements in solar thermal technology were made during the nineteen seventies when the price of oil started to rise and the use of solar power in the space program kick started research into solar thermal energy. 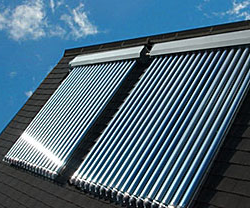 Serious development of solar heating technology started in the late nineteen seventies which coincided with the initial warning about a connection between climate change and fossil fuels. Improvements in the technological capability meant that solar thermal could now be used in milder climates and were integrated with antifreeze systems during the nineteen eighties. Major funding programs for solar energy began during the nineteen eighties creating a major boost to the industry with many new companies springing up to fill demand for renewable energy in the United States. Major advancements in solar thermal energy are being made all over the world with countries like Spain and Australia among the current market leaders. Israel has also been a substantial contributor to the industry since the nineteen fifties. During the nineteen fifties Israeli engineers and scientists devised a more efficient surface for solar panels. The new surfaces were called selective black surfaces and were more effective at collecting and storing heat which was particularly useful when applied to solar water heating. In 2007 Spain constructed Europe’s first fully commercial solar towers. The towers utilize a molten salt storage system to ensure power is available twenty four hours a day. The storage system also ensures power is available even during overcast days. Spain is currently the fourth largest manufacturer and a world leader in solar technology and the majority of Spain’s solar energy output is exported across Europe. The solar industry continues to be at the forefront of the energy revolution helping to bring the switch from a fossil fuel driven economy to a renewable energy driven future.